It was Super Sunday for Ben Ainslie and Land Rover BAR whose second place in the last of Sunday’s three races gave them the overall regatta win at the Louis Vuitton America’s Cup World Series Portsmouth. The wind on Sunday presented the teams with perfect conditions for the AC45F boats to foil, wowing the tens of thousands of people along the Southsea shoreline who had come out to cheer on their favourite teams. The loudest cheers were for Land Rover BAR and it was the British team who took the early lead in race one. Oracle Team USA led the chasing pack, but the crew on board Land Rover BAR had their foot on the gas and kept building an ever bigger lead, using local knowledge and the cheers of the crowd to help power them to victory in race one, an ominous sign for the rest of the America’s Cup fleet. Behind them, Oracle Team USA was second, Emirates Team New Zealand third, Softbank Team Japan fourth, Artemis Racing fifth and Groupama Team France sixth. At the start of race two it was Oracle Team USA which seized the early advantage, leading Softbank Team Japan and Land Rover BAR at the first mark. 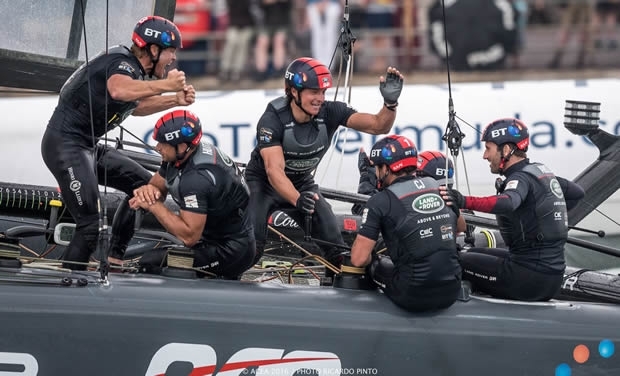 Jimmy Spithill’s US crew was right on top of its game and increased its lead throughout the race, but behind, Emirates Team New Zealand, Land Rover BAR and Softbank Team Japan were engaged in an almighty scrap for second with Artemis Racing and Groupama Team France in fifth and sixth respectively. It was Land Rover BAR in second, Softbank Team Japan in third, Emirates Team New Zealand in fourth, Sweden’s Artemis Racing in fifth and Groupama Team France again in sixth. Victory for Oracle Team USA set up the final race to the Louis Vuitton America’s Cup World Series in Portsmouth with Land Rover BAR only needed to finish ahead of Oracle Team USA to win overall and to take top spot in the Louis Vuitton America’s Cup World Series standings. The clock ticked down to the crucial start of race three and it was Oracle Team USA who led off the start line, just ahead of the British team and the Kiwis on board Emirates Team New Zealand who were watching their series lead disappear ahead of them. The tension was palpable as the British and US crews made their way back down the course, but just after the midway point of the race Oracle Team USA started to edge further away, leaving Ben Ainslie and Land Rover BAR to defend their second place from Emirates Team New Zealand. That second place was all the British team needed to secure overall victory in the regatta and it was never really in doubt, finally winning the regatta by a single point from Oracle Team USA 82 to 81. The win also put the British team into first place on the overall Louis Vuitton America’s Cup World Series leaderboard, overtaking Emirates Team New Zealand who drop to third with Oracle Team USA up to second, Softbank Team Japan in fourth, Artemis Racing fifth and Groupama Team France in sixth. Sir Ben Ainslie, Skipper, Land Rover BAR commented: “I think it’s been a brilliant weekend. For us to race in Portsmouth, in front of our home crowd with the weather playing its part and two cracking days of racing, as a home team to win in front of our home crowd is the best thing we could do. That was our goal for here, and with our long-term aim of bringing the Cup home, this weekend was just the start of it. Jimmy Spithill, Skipper, Oracle Team USA added: “It was a good Sunday, we won the day, but it just wasn't enough to win outright. In the end it came down to consistency. On Saturday BAR had a fifth and we had a sixth and that's the one point that would have made the difference, but it was still great racing. The guys did a good job of fighting all the way through to the end. In the last two races today, we hit Ben every time we could, but we just couldn't push him back far enough to let a third boat through. Despite that, the guys should hold their heads up. We sailed very, very well today but we have to take our hats off to Ben and congratulate his team. Iain Percy, Tactician, Artemis Racing: “First I want to say that this weekend has been an amazing event for British sailing. In the 70s and 80s sailing became one of the biggest sports in the UK and now there is a lot of interest in our sport. With that in mind it was no surprise to me that there were thousands of people here this weekend. It bodes well for our sport that both here and in Chicago there were so many people coming out to see our sport and that’s very good news for where we are going.